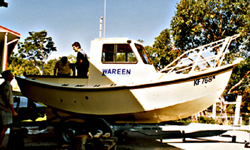 Smart traditional style fishing boat with a real character look. Length 6 metres (20'0"). Build in aluminium or plywood. Motor 20hp diesel maximum. 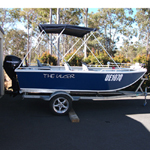 Can be buillt as a semi enclosed open deck boat with kill tank and hold for mackerel fishing. Can be either Aluminium or timber ply. Great first boat to built. Open fishing or makerel fishing version available. Easy to build. Plans detail building jig. Has tubular stem, chines and sheer bar. Built inverted on jig. 3mm plating on 50 x 6mm flat bar frames. Fully detailed engineering plans. 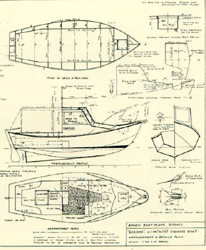 Excellent seakeeping shape, very safe and dry boat. This boat has real character. Always draws comments. Suitable for trailing behind a heavy 4WD or larger vehicle. 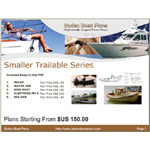 Study Plan PDF02 "Smaller trailerable craft"